What is up with the birding community in the northern part of the US recently? Have we all gone completely mental? I recently heard Kenn Kaufman refer to the birding community as a family and on the one hand I like that idea, but one the other, I feel like it’s one big uncomfortable Thanksgiving Dinner with odd relatives and awkward conversations and all you can think about is drinking as much as possible or eating extra dessert to keep from verbally exploding. First there’s a story about the Madison Audubon Society ending up in court because of an election to vote in new officers and one person recruited over a 100 new members and signed them up the night of the annual meeting and ousted out the expected election offices which of course was followed by a law suit. You can read all about it here. Really? Buying a bunch of votes and dropping it like a big crap bomb at an annual meeting may get you what you want but boy howdy, I can’t imagine people lining up to join that group. I just finished attending a really great conference called Focus on Diversity, The Changing Face of American Birding–which is an awesome event, (next year’s event will back up to the 2013 Rio Grande Valley Bird Festival so it would be a great way to get 2 awesome events in one trip). The event brings in people of color in the birding world and we engage in discussion to find out why birding is a bit white in nature and what we can do to be more inclusive. The 2012 event was held at Minnesota Valley National Wildlife Refuge. The conference timed nicely with sparrow migration and everyone was anxious to get views of reported Nelson’s Sparrows that were obligingly hanging out in some mud along a beaver pond. 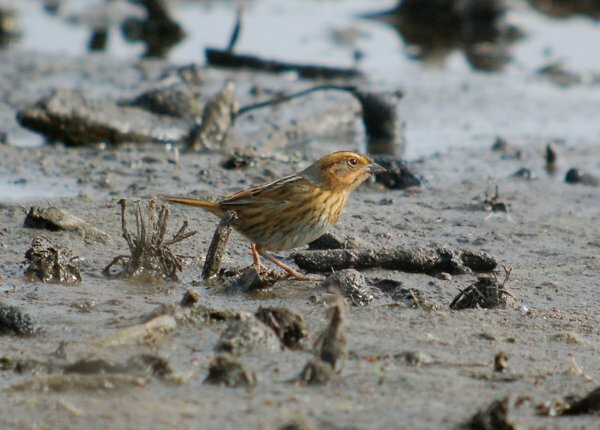 The sparrows are easily viewed, all you have to do is wait a few minutes and eventually they come out of the surrounding vegetation to feed on the mud. I digiscoped the above bird after waiting for 15 minutes. 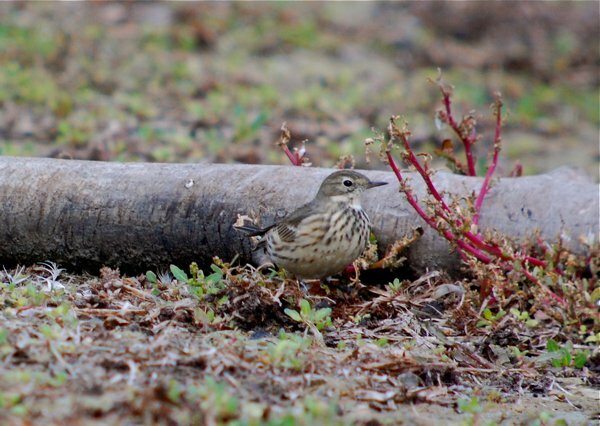 Other birds can viewed there like the above American Pipit, Wilson’s Snipe and White-crowned Sparrows. It’s a pleasant way to spend and hour on the refuge. Pretty much every birder in the area has gone out to see theses birds and full frame photos are popping up on blogs, Twitter accounts and Facebook pages and groups. 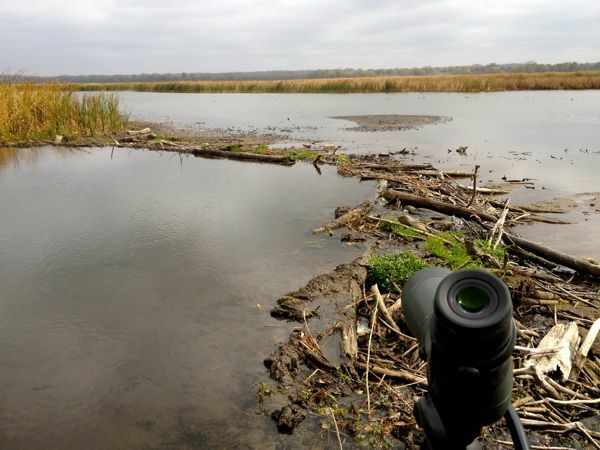 The spot to view the sparrows and pipit is right on a beaver dam surrounded by mud, it’s pretty cool. There are worse ways to spend an hour than by standing on a beaver dam. On a Minnesota Birding Facebook page, someone related a story of finding four people taking photos of the birds only instead of standing at the dam, they were in the mud…well sinking in to the mud. The person confronted the group about being too close, the people with the cameras were standing on the mud that the sparrows feed on, creating deep trenches that sparrows wouldn’t be able to access for food. An altercation ensued and things ended in assault. I didn’t get a lot of the details but was going to follow the conversation on the Facebook page. When I went back later, the post had been deleted by the admin because it wasn’t positive and the admin wanted to avoid “a-political” posts on the page. What the heck, people? If an altercation goes down at a popular birding spot, I want to know. I think the reasoning for the deletion was that it was believed this was a complaint of birder vs photographer. If someone is out with a bunch of camera equipment aimed at brown bird–they are a bird watcher with camera equipment, not just a photographer. Now, if they are far too close to the bird they are clearly engaged in ignorant behavior but birders who do not take photos are capable of the same idiot behavior. If this was a case of escalating behavior and poor word choices on both sides, I’d still rather know about it. But keeping things off of listservs or birding groups because they are unpleasant doesn’t help anything. These things come and go with a regular rhythm. But never fear: it’ll be November soon, rarity season, and everybody will get busy looking at birds instead of birders. Things got way out of hand on that birding assault thread to the point where someone compared the deletion of the original post to the Penn State molestion coverup. It also seems that it may not have been simply a case of someone being assaulted for no good reason but more of a verbal assault by both parties that lead to some good old fashioned fisticuffs. Birder on photographer violence? Audubon hi-jinks? This is pretty good. Is it strange that I assume a photographer was the one who started the altercation? I think Kenn’s family comparison is not inaccurate; my family is pretty dysfunctional!